Namibia by car. From Botswana border to Rundu. We crossed the Zambezi - Caprivi Area, from Ngoma (Namibia-Botswana border) coming from Kasane (Botswana Chobe national park), passing Katima Mulillo and heading to Rundu, in October 2014. It´s around 600 km. We did this route in 3 days (tarred roads) as we wanted to do a couple of stops in the area. Recommended. It´s the “green” Namibia, with rivers and bush, the African Namibia, with more people (never too many). Many traditional villages and cattle along the road.We liked this region! The main road B8 is tarred, good, called the "four rivers road”. It crosses parts of national parks but we didn´t see any animal. Bad luck! The only towns are Katima Mulilo and Rundu, good stops for supermarkets, banks, petrol, etc. There are petrol stations and small shops at Kongola and Divundu (even a small supermarket there too). 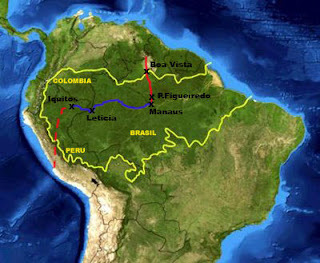 In all these places and its surrounds, you´ll find camps and accommodation. Shopping town near Botswana (Ngoma border 70 km) and Zambia (bridge and border at 4 km). Different lodges and camps along the Zambezi river (east of Katima), famous for fishermen. We didn´t stop, just passed Katima. 110 km west of Katima Mulilo we stopped in Kongola (just a petrol station and small shops) and had a look at a tourist craft shop. It´s on the B8- C49 crossroad. Road C49 is almost completely tarred now. Secondary road between Katima Mulilo and Kongola by the south, 200 km long, access to Mamili National Park (only for well prepared 4x4) and Mudumu National Park (4x4). From the B8, between Kongola and Divundu, different entrances to Bwabwata National Park (4x4). These parks seem to be really wild, remote and lots of game, but we didn´t go with our Ford Fiesta. Camps and lodges mainly south of Kongola, access through C49 on 25 km, on the shores of Kwando river. Sandy access roads, not always easy without a 4WD. Bumhill and Kubunyana community camps are closed in 2014. Check! Price for camping: 95 N$ /pp (we finally paid 85 N$). Lonely, rustic and basic. No electricity, tap water comes from the river. Quite expensive for the services. 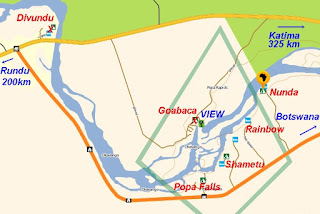 The location it´s 4 km west of Kongola on the B8, following the acess road for 2 km, on the shores of the Kwando river (sandy access but fine for a sedan). There´s also a lodge (access by 4x4 or boat). 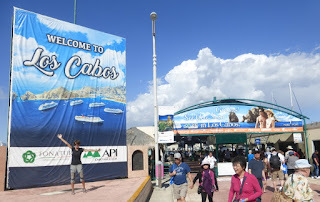 Boat trips are expensive (around 300 N$). We just listened to an hippo from the camp and special singing frogs. Divindu is 200 km from Kongola and Rundu. This area is good to stop and stay because the Okavango river and Popa Falls are near. Crossroads of B8 and D3403 (only 20 km to Botswana border). Nice and relaxing camps near the river. Camps and lodges on the shores of Okavango river, on the road to Botswana mainly (access roads are fine without a 4WD but sandy). 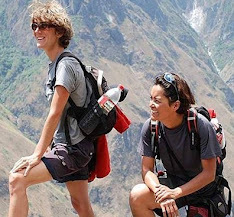 Price: Camping 90 N$/pp. Good, cheap and even grass and shade, just on the river shore. Pool. Tap water from the river, so better ask if you can get boiled water from the kitchen. They also have rooms (quite expensive). Nice place! The location is 7 km south of Divundu, on Botswana´s road. From the camping you can see hippos in the morning.They will wake you up! Safari-boats, but a bit expensive (250N$/pp on a 5 people boat, 180N$ if more). Other camps around, but more expensive and not better. On the Okavango river, small falls. We didn´t visit the falls, they say it´s nothing too special. 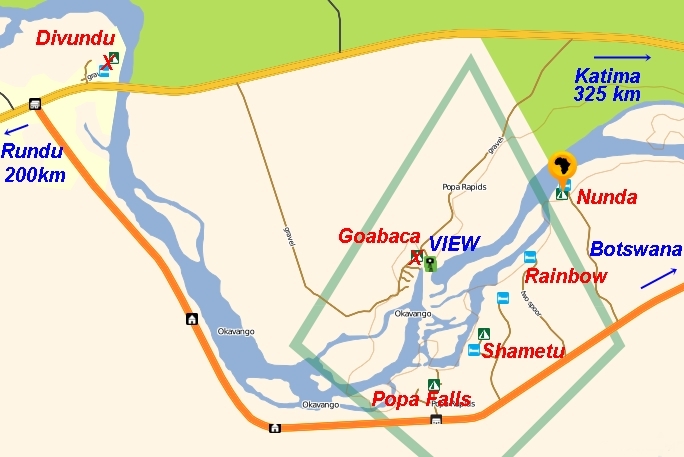 You see the falls from 2 camps only, Goabaca Community Camp (4 km east of Divundu on the B8) and from NWR Popa Falls Lodge, 5 km south of Divundu on the D3403 (10 N$ entrance fee, free if you camp there). NWR has a campsite(100 N$/pp) but not near the river. Access from road D3403 (road to Botswana). Entrance Fee: 40 N$/pp (foreigners) and 10 N$/car. Apparently, Buffalo NP is fine with a sedan car, but we didn´t go. You can see animals (giraffes, zebras, impalas, etc. ), confirmed by other travelers in the campsite. It`s not a touristic plan, but thanks to Couchsurfing and Adam (Peace Corp from USA) we visited the school and shared some moments talking with the students. Comercial city in the Caprivi, fast growing. Supermarkets, banks, gas stations, etc. Angola is on the other side of the river (no bridge). On the Divundu-Rundu road (200 km), we saw many small roads heading north to the river (10 km away, a few one are tarred), heading to campsites for fishermen. We didn´t go. We saw 2 campsites/lodges near the river, passing the shopping area, Sarasungu and Ngandu. Very good, clean, even grass. Pool. Free wifi. They have rooms too (expensive). Close to the supermarkets and town but calm location, but not on the river shore.